Product prices and availability are accurate as of 2019-04-22 00:50:40 BST and are subject to change. Any price and availability information displayed on http://www.amazon.co.uk/ at the time of purchase will apply to the purchase of this product. The most richly flavoured of all Scotch whiskies. Created from hand selected oak casks for perfect balance and flavour. Distilled on the remote island of Islay off the west coast of Scotland. 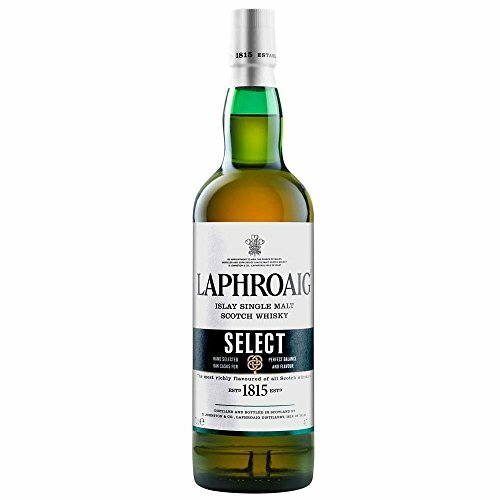 This special Laphroaig is created from carefully selected casks of each of our key styles, stretching back in time - with one notable addition. The heart of the spirit is drawn from a final maturation in new American Oak casks, rarely used for Scotch Whisky maturation. Six months of this maturation takes place in the highest, warmest reaches of our warehouses during the Scottish summer. With spirit selected by our master distiller from Quarter Cask, our PX Cask and Triple Wood (European Oak casks), it represents a subtle blending of peat, oak and sweetness. Bottled at natural colour, the result is an exquisite Laphroaig with our trademark 'peat reek' matched by an additional layer of complexity and depth brought about by the fusion of the maturation styles and different oaks, which we hope will surprise and delight you.